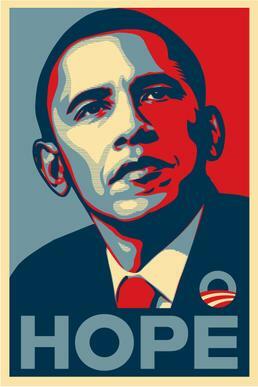 The gist: There may not be three other words that are more recognizable in 21st century American politics (maybe even global politics) than Obama’s “Yes we can.” It was slapped on posters (see below), made into a music video*, adopted by the pro-marijuana lobby (“Yes we cannabis”), and so on. The slogan is derived from that of Cesar Chavez, the founder of the United Farm Workers union, who used the equivalent Spanish phrase “Si se puede” (translated by the union as “yes, it can be done!”). 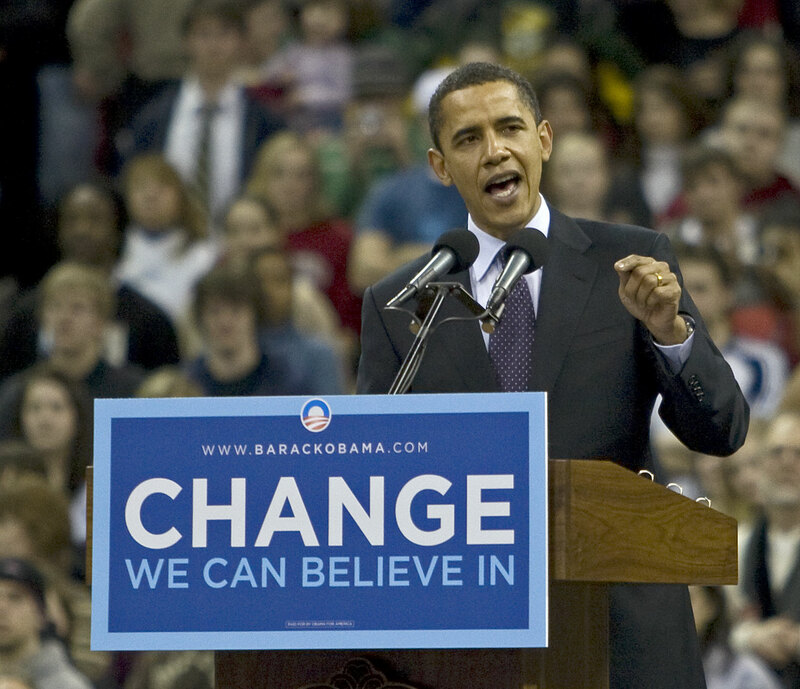 In Obama’s “Yes we can” speech, in Nashua, New Hampshire, on January 8, 2008, after having narrowly lost the state to Hillary Clinton (in the popular vote – they both received nine delegates), he stated that “generations of Americans have responded with a simple creed that sums up the spirit of a people: Yes we can.” The pithy statement worked well with the campaign’s other slogan, “Change we can believe in,” in that it was the call to action to make the changes in Washington that represented (back then, at least). Obama and his head speechwriter Jon Favreau (not the movie director of the same name) reportedly decided to recycle the phrase from his 2004 Illinois senate campaign just half an hour before he made his Nashua speech. Obama campaign “Yes we can” poster with “rising sun” logo above. The clue: This clue is set up to walk you right to the correct response, from giving you the speech’s lead-up that introduces the correct response as a phrase you’d tell someone, to the number of words in it, to the fact that it was his campaign slogan (although Wikipedia claims his “slogan” was “Change we can believe in,” with “Yes we can” being his “chant.” Not sure what the difference is, myself.) I doubt there are too many North Americans of age to appear on Jeopardy! that don’t remember the phrase. Even if it’s a somewhat easy $1000 clue, it closes the category nicely, just as the slogan itself summed up the spirit of the campaign. In Jeopardy! : It’s tough to search the J!Archive for a phrase consisting of three extremely common words – searching for”yes we can” returns 284 clues, almost all of them having nothing to do with Obama. Ctrl-f’ing for “Obama,” “slogan,” “president,” and so forth pulls up one other clue that read simply “Yes we can,” and was looking for “Obama.” Not much of history there, then, but like yesterday’s clue, this one is likely to ripen with age and show up more often in the future. The book itself is a personal exploration of Obama’s beliefs, political, religious, and otherwise, and his thoughts on American culture. It would remain on the New York Times bestseller list for 30 weeks, and the audiobook won a Grammy for Best Spoken Word Album in 2008. The clue: A straightforward clue about a very well-known book, the only tricky part here is to not get it confused with Dreams from My Father, which had its own subtitle, A Story of Race and Inheritance. 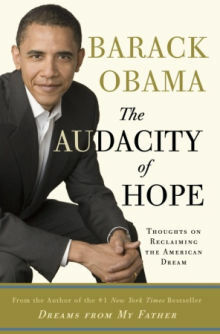 Shouldn’t be too hard to keep them apart, though; Obama’s first book was an examination of his own upbringing by his white mother and Indonesian stepfather in the shadow of his African father, so the subtitle certainly fits. In Jeopardy! : The Audacity of Hope appears in four clues in the J!Archive… and two category titles: THE AUDACITY OF BOB HOPE and THE AUDACITY OF HOPE… which was also about Bob Hope. Maybe the writers ought to be checking the Archive a bit more often? Anyway, if the book hasn’t shown up in too many clues it’s likely only because it’s relatively new – expect it to show up more, especially as Obama’s second term comes to a close. $600 clue: Obama threw out the first pitch of the 2009 all-star game wearing the jersey of this, his favorite major league team. The gist: After finishing up his undergrad at Columbia, Obama moved to Chicago where he got a job as a “community organizer,” a position that would raise the ire and ridicule of the Republicans throughout the election season. After three years he left Chicago to attend Harvard Law School, but returned to the city as a Fellow at the University of Chicago in 1991, where he would continue to teach until 2004, including during his tenure as Illinois senator, until his election to the U.S. Senate in 2004. Obama’s connection to Chicago, and his love for his Chicago White Sox, has been well-documented. The President repping his (American League) not-quite-hometown boys. The clue: This one’s fairly trashy, to be honest. It’s something of a you-know-it-or-you-don’t. The argument could be made that if you know Obama’s connection to Chicago you could come up with the answer, but let us not forget that Chicago is one of three cities that has two baseball teams (along with New York and L.A.), the White Sox in the American League and the Cubs in the National League, so even knowing that only gets you to a coin toss without some more info. I’m not really sure either if following sports or following politics would help you with this one more, and while I’m generally a fan of cross-disciplinary clues, this one isn’t the best I’ve ever seen. Oh well. Trash can be fun too, and I’m sure the producers like to appeal to the (recently) 5th largest city in North America. In Jeopardy! : The White Sox only come up in 25 clues in the J!Archive, less than half that of the NY Yankees and a quarter of the Dodgers (Brooklyn and L.A., that is). Many of the clues are about the thrown 1919 World Series and that year’s team dubbed the “Black Sox,” and a fair number are your usual sports fare of naming naming players (“Shoeless” Joe Jackson comes up a few times) or stadiums (formerly Comiskey Park, currently U.S. Cellular Field) and looking for the team. If you want to study up on your baseball, the White Sox are are somewhere above the middle of the pack in importance, but better to start with the bigger fish. $400 clue: President Obama’s father, Barack Sr., was born in this country & was eventually a senior economist in its government. The gist: Obama’s namesake father, as we discussed yesterday, was born in Kenya and moved back to that country after going through a divorce from the President’s mother. Although not as famous as his son, Barack Sr. was no slouch himself, earning a Master’s degree in economics from Harvard just before returning to Kenya and marrying his second wife. He eventually earned a position in the Kenyan Ministry of Finance but was fired following the assassination of Tom Mboya, Minister of Economic Planning and Development and Barack Sr.’s boss, and the subsequent souring of the relationship between Barack Sr. and Jomo Kenyatta, first president and founding father of Kenya (and father of current Kenyan president Uhuru Kenyatta, the two of them being among the easiest-to-remember world leaders given their surname). Barack Obama, Sr. died in a car crash in 1982. The clue: Another clue, like yesterday’s, whose correct response has probably been propagated more by the birthers than by civic awareness. There are no real clues to help you figure it out if you don’t already know the answer, but thanks to the crazies most Jeopardy! viewers probably do. Even if you’re only superficially familiar with the conspiracy theories, you’ve probably heard Kenya used in connection to Obama’s father as ostensible evidence for the President’s alleged birthplace. I do like that the writers threw in the bit about his being a senior economist, a nice little addendum used to teach while asking. In Jeopardy! : Again like yesterday’s clue, Kenya’s apparently never been asked about in connection to Obama until last week. Maybe with Obama in his second term the writers are more willing to delve into “controversial” territory with some birther-baiting, or to make oblique reference to such theories? Your guess is as good as mine. Kenya, of course, as a populous and relatively prosperous African nation, has appeared in a good number of clues (171), so you might read up on it if you have a few minutes – the most common topics are the capital Nairobi and safari-type wildlife. $200 clue: (Robert Gibbs reading) From 2009 to 2011 I served as President Obama’s press secretary; in 2008, while our families were vacationing together in this, his native state, he served as babysitter for my 5-year-old son. The gist: Obama was, of course, born at Kapiʻolani Maternity & Gynecological Hospital in Honolulu, Hawaii. Although a prepared Jeopardy! contestant ought to be familiar with the birthplaces of the U.S. presidents, Obama might be the most well-known of all because of the proliferation of “birther” conspiracy theories, claiming he was actually born in his father’s native Kenya. Obama’s parents met at the University of Hawai’i at Manoa, where they were both taking Russian classes. They got married in early 1961 and Obama was born in August of the same year – in 1964 the two would divorce and Barack Obama, Sr. returned to Kenya (more on that tomorrow). The Hawaii vacation the President apparently took with (at the time) future Press Secretary Gibbs took place in August 2008, a few months before that year’s election. One can imagine it would be a stressful time, and the President apparently spent most of it golfing and lounging on the beach – an extremely boring photo gallery can be seen here, if you’re into that sort of thing. The clue: A $200 clue about a current American president is likely to be a softball, and this one doesn’t disappoint. So long as you can toss out the junk about Gibbs and the family vacation and hone in on what the question is actually asking (“this, his native state”), it shouldn’t present a problem to most viewers or contestants. Certainly, though, the birther conspiracies and the absurd amount of coverage they received from the American press contribute to this clue being so easy. If the same clue was asked ten years ago about George W. Bush, I suspect that far fewer people would give the correct response of “Connecticut,” especially with that president’s carefully manicured “Texan everyman” image. In Jeopardy! : Amazingly, Obama and Hawaii only show up in clues together three times, and in one of them it’s a passing mention on the road to Illinois, where he worked after attending Columbia University and would eventually be elected senator. Must be that the writers found asking about Obama’s birth state too easy even for previous $200 clues, although I’m surprised they couldn’t have found ways to mask it into a bit more of a thinking clue. In general, though, knowing Presidents’ birthplaces is one of the more important lists to memorize to succeed in Jeopardy! (here‘s a Sporcle quiz to help out), so keep on knowing the answer to this one. One fewer to memorize. Thanks for joining me for the first installment of Deeper Into Jeopardy! We’ll be back next Monday with a new category. $2000 clue: Home team France might rather forget this October 1415 English Victory. The gist: The Battle of Agincourt (or ‘Ah-zeh-coor’ as Alex said in his questionable French accent) was a major English victory during the Hundred Years’ War (that the French eventually won, though only almost 40 years later). It was the first major field battle between English and French forces after the “Second Peace” of 1389-1415 (you can see how “Hundred Years’ War” is something of a misnomer), and took place just a few months after the Peace ended – Henry V, the new English king, had sent an envoy to the king of France, Charles VI, to make his claim on French territory, and followed it up with a 10,000-strong army. He laid siege to Harfleur, and by the end of September had taken the city, but winter was setting in and he had to quarter his troops. He elected not to return to England, but to station himself in Calais, English-occupied territory on the mainland. On his way, however, he encountered a very large French army and was forced to fight lest more of his troops succumb to sickness and hunger. A classic example of brains over brawn, Henry made masterful use of his longbowmen, and the French were routed – the English took so many prisoners that they outnumbered the English soldiers, and Henry ordered their execution. Although not decisive, Agincourt was a major victory and led indirectly to Henry’s marriage to King Charles’ daughter Catherine of Valois at the 1420 Treaty of Troyes… although by the end of the War (31 years after Henry’s death), and notably after the rise of Joan of Arc, Charles VII (or the Victorious) would take the French throne. The Battle of Agincourt was such an important event in English history that Shakespeare would make it the focal point of his play Henry V (the King’s St. Crispin’s Day Speech is one of the more famous of Shakespeare’s monologues: “we few, we happy few, we band of brothers…”). In Jeopardy! : This one was the only clue in the category where the correct response wasn’t a country – instead they supply that information in the clue, and ask you for the more specific information. Luckily they also give you one of the two big clues about Agincourt: 1415. The number shows up 27 times in the J!Archive, and any time fighting is mentioned, the answer is either the (Battle of) Agincourt or Henry V. (Most of the other times 1415 appears, it’s the first through fourth digits of pi after the decimal point, and the rest are about Czech religious thinker Jan Hus, who was burned for heresy in the same year.) The other big thing about Agincourt – the longbows – isn’t mentioned in this clue, but references to it (“archers” or “archery” always, strangely, never “longbows”) appear in several of the other Agincourt clues, although it shouldn’t be confused with the 1346 battle of Crecy, earlier in the Hundred Years’ War, that also relied on longbows to bring the English to victory. The best thing to remember about Agincourt, though, is definitely 1415, followed closely by Henry V as the English commander, especially since that doubles as a Shakespeare clue. $1600 clue: Country that hosted the 1847 Battle of Chapultepec. The gist: The Battle of Chapultepec was an American victory during the Mexican-American War, taking place at Chapultepec Castle west of Mexico City. President Polk’s manifest destiny was churning westward across the continent, eventually reaching the Republic of Texas, which Mexico didn’t recognize (they still considered Texas part of their territory, despite the 1835-36 Texas Revolution). The Mexican-American war broke out when U.S. troops moved into Texas and northern Mexico to enforce the American claim on Texas south of the Nueces River. American troops advanced on Chapultepec because of its strategic position with regard to Mexico City. Fighting began with American artillery fire on September 12 and the charge, ordered by Winfield Scott, commenced the next day. The Americans suffered far fewer losses than the Mexicans, although several high-ranking U.S. officers were wounded, and the Mexican General Nicolas Bravo was taken prisoner. American troops went on from Chapultepec to storm and occupy Mexico City (remembered in the opening line of the Marines’ Hymn, “From the halls of Montezuma”), and the war would be declared won in February of the following year. In Jeopardy! : I’ll admit to never having heard of this battle before, but I suspect (and hope) that someone who went through an American school system would have some knowledge of the Mexican-American War that might include Chapultepec. Luckily, you don’t need to know anything about the actual battle to know that it must have taken place in Mexico. The key to getting it right is to recognize “Chapultepec” as a classic Aztec-sounding word (that is, deriving from the Nahuatl language that the Aztec people spoke – it happens to mean “at the grasshopper’s hill”) – lots of ‘p’s and ‘ch’s, L’s and T’s together, and a ‘pec’ on the end of a word make it a sure bet it’s coming from Mexico. You could also realize that 1847 was in the middle of the Mexican-American War, but relying on the year is not a great idea as there plenty of other battles being fought in the mid-19th century, and in fact the Battle of Buena Vista, also in 1847 and part of the same conflict, shows up in a few clues in the Archive as well. However, if the clue mentions the Battle of Chapultepec, the correct response is always “the Mexican-American War” or something like it. If it just mentions Chapultepec without the battle, there are two choices: it’s either Maximilian, the Emperor of Mexico installed by Napoleon III from 1864-1867 who took up residence in Chapultepec Castle, or it’s Mexico City in geography questions, which just happens to be nearby. Should be pretty easy to tell which one they’re going for from the clue. $1200 clue: Go to this country to meet your 1815 battle site Waterloo. The gist: The clue’s presented as a bit of lame wordplay on the phrase “meeting your Waterloo,” a gag that certainly doesn’t help you if you don’t know the answer anyway. The Battle of Waterloo, in Belgium, was the 1815 battle that finally saw the defeat of Emperor Napoleon by the Seven Coalition, an amalgam of European armies led most famously by Arthur Wellesley, the 1st Duke of Wellington. After his disastrous invasion of Russia, Napoleon was on his way back to France to defend it from attacking Coalition forces in order to preserve his throne. * In late 1812, Napoleon’s devastated forces had limped back westward after their disastrous half-year-long invasion of Russia. Back in France, Napoleon was able to muster 350 000 troops in the winter of 1813, with which he engaged the Sixth Coalition army, but by mid-1814 he was forced to abdicate the French throne and to go into exile on Elba. On his escape from the island in March 1814, he regained the loyalty of the French army and retook Paris from King Louis XVIII. In response, the Seventh Coalition was formed at the Congress of Vienna. Napoleon saw that he had no chance to keep Paris if the Coalition armies were able to coordinate their attacks. In an attempt to defeat as many of the Coalition’s contingents individually possible, he first won a victory against the Prussian forces at Ligny. He then elected to engage the British (and Dutch) forces at Waterloo, about 13 kilometres south by south-east of the Belgian capital Brussels. Although the battlefield presented significant advantages to Wellington’s forces, Napoleon decided he had no other choice, and Wellington offered battle upon learning that the regrouped remnants of the Prussian contingent, under the command of Gebhard von Blücher, was near enough to offer their support in battle. That decision would prove conclusive when a Prussian attack broke through Napoleon’s right flank, allowing Wellington’s forces to go on the offensive, throwing the French army into disarray. Both sides suffered huge losses, though Napoleon suffered more – the battlefield following the fight, strewn with enormous heaps of mangled bodies, was described as a “sight too horrible to behold” by Major W. E. Frye. After Waterloo, Napoleon abdicated his throne and was exiled to Saint Helena, a small volcanic island more than 2000 kilometres from the western coast of Africa, where he remained until his death in 1821. In Jeopardy! : A favourite. Waterloo appears in 81 clues in the J!Archive, 62 of which have some sort of military flavour, be it mentioning a general, a battle, Napoleon himself, or something else along those lines. Again we see a familiar triangle, where many clues give two of “Napoleon,” “Wellington,” or “Waterloo,” and the correct response is the remainder. Many of the clues, including this one, also mention 1815, the year the battle took place, but 1815 also shows up with reference to a number of other things, including the Battle of New Orleans that was won by Andrew Jackson, so better not to rely on the year in this case, although a couple clues are looking for “1815” as the correct response. Also coming up as responses are Napoleon’s “Old Guard,” which made the final charge at the battle. Beyond those, Waterloo does come up in some other contexts: we see Abba come up in three clues for their hit song “Waterloo,” and a number of American cities called Waterloo are mentioned, most notably Austin, Texas, which was originally named Waterloo. (There also happens to have been a stint of filming Clue Crew clues at the Trek Bicycle Corporation in Waterloo, Wisconsin, so those six clues all appear in Archive searches as well. We won’t worry about them here). Ed. note: reader Justin pointed out that this leaves quite a lot of time and important events out of Napoleon’s story, so I’ve attempted to improve it. I also added a pretty painting. $800 clue: Ancient Callipolis is now this Turkish site of a World War I clash. The gist: The Gallipoli Campaign, sometimes called the Battle of Gallipoli (which is what I’ve always called it), was a major Allied defeat and Ottoman victory in World War I. 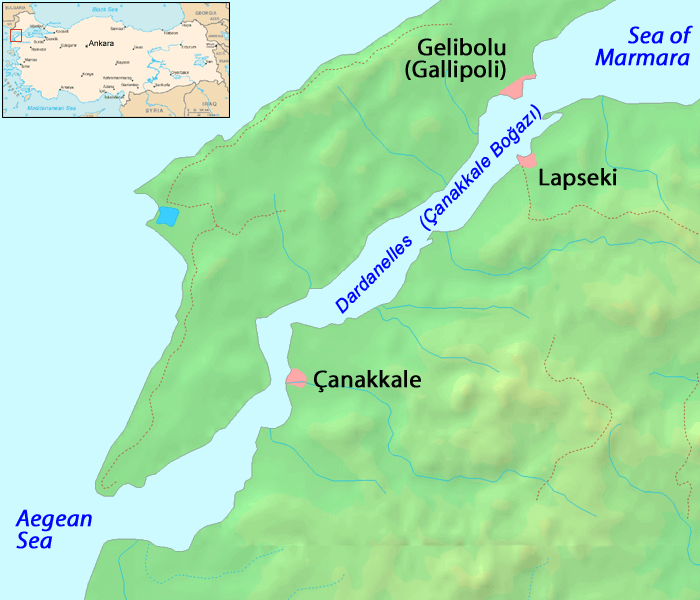 The Allies attempted to launch an amphibious assault at Gallipoli, the peninsula that forms the northern bank of the Dardanelles, which is the strait that links the Mediterranean (and the Aegean) to the Sea of Marmara (here’s a map). The campaign, which began on April 25, 1915, under the faulty recommendation of Winston Churchill, then First Lord of the Admiralty, finally ended eight months later on January 9, 1916, when the Allied forces retreated to Egypt, then a British protectorate. It was a defining moment of both WWI and the history of modern Turkey – Kemal Ataturk, the founder of the modern Republic of Turkey, was himself a commander at Gallipoli. Although this clue doesn’t give you much detail into the battle itself besides that it took place during WWI, it primes you to pick up on the evolution of Callipolis (Greek for “beautiful city”) into modern Gallipoli, much like ancient Tripolis (“three cities”) is now Tripoli, the capital of Libya. In Jeopardy! : Gallipoli appears in 15 regular clues and 1 Final Jeopardy! clue in the J!Archive, 12 explicitly concerning the battle. Most of the clues mention WWI and Turkey (unless Turkey is itself the answer), the two only appear together in clues with “Gallipoli” as the answer. Two clues also mention Australian filmmaker Peter Weir’s film Gallipoli, which was about the campaign – Australian and New Zealand forces played central roles in the battle, and the single Final J! Clue asks about a memorial tree planted by Australia in 2005, for the battle’s 90th anniversary. Also, Churchill gets two mentions for his blunder, and Ataturk gets one for his success. Two clues mention Gallipoli without reference to WWI – one simply asks which country the peninsula is in, and the other is looking for the Ottomans, who took Gallipoli from the Byzantine Empire in the 1370s. It’s very likely, then, that in a military context that the clue will include two of “Turkey,” “WWI,” and “Gallipoli,” and the correct response will be the one remaining… although I’m a little surprised there’s never been a correct response about its geography more specific than “Turkey.” Better keep the Dardanelles in your head as well. I’ve come up with a new idea for this blog, which I’m hoping is something that I can sustain writing about more than once every couple months. Among the most amazing things on the entire internet must sit J!Archive, a fan-created and -maintained database of (nearly) every Jeopardy! clue, game, contestant, wager, slang term, and anything else you could possibly want from that show, going back 30 seasons September 10, 1984, the first episode hosted by Alex Trebek. There’s even a Chrome extension that lets you play through the archives games as if you were watching them. But the website’s pertinent feature as far as we’re concerned here is that it’s searchable – put any word into the search bar and it will spit back every clue that word’s appeared in (in part or in whole). So anyway, my plan for these posts is to taken a category that appeared on Jeopardy! recently*, and dive deeper into one of the five clues every day Monday to Friday. We’re going to look at both the trivia itself and the subject’s history on the show. It should bring up some interesting information, be of some help to Jeopardy! hopefuls like myself, and most importantly, I won’t have to think of topics myself. The correct response will of course be in the explanatory paragraph (in italics), and it will also be below the clue in the same colour as the background – highlight just after where it says “Correct response:” to see it. By looking at how Jeopardy! has used certain bits of trivia in the past, I’m hoping to show how the bits don’t exist by themselves, but relate to all sorts of other topics as well. So let’s launch into the first one with a category that appeared Friday, January 17, 2014: Battles! $400 clue: Marathon was fought in this present-day country in 490 B.C. The gist: While this clue doesn’t make explicit reference to the very first marathon race – when Pheidippides, an Athenian soldier, ran from the plains near the city of Marathon, Greece, to Athens, to announce the stunning Greek victory over the invading Persians – I suspect that’s the path of least resistance to the correct answer for most viewers. The Battle of Marathon was a decisive turning point in the Persian War, and possibly the first point in the war that your average Greeks could have thought without deluding themselves that they might not fall under Persian tyranny. Athens and its ally city Plataea sent around 10 000 soldiers under the leadership of the generals Miltiades and Callimachus to face perhaps two and a half times as many Persians fighting for their king, Xerxes I. Thanks to some clever tactics and, perhaps, the cockiness of the Persians, the Greeks outflanked the larger Persian force and defeated them. (Sparta, who had refused to send troops because of a religious festival back home, arrived the day after the battle, took a look at the battlefield, and congratulated the victorious soldiers.) The Persians boarded their ships and sailed directly for Athens, but on finding that the Athenian army had beaten them to the city, sailed back east. They left Greece alone for ten years, and, having never forgotten their defeat by the Athenians, invaded again in 480. In Jeopardy! : While “marathon”appears in the J!Archive 134 times, most of those are about athletics – only 16 of them are about the battle, and several of those mention both (interestingly, a couple clues give different distances for Pheidippides’ run, from 23 miles to 25). Ten of the 16 also mention the year 490 B.C., and the number 490 hasn’t appeared in any clues not about Marathon, so if the clue is about a place (or a race) and mentions 490 it’s a safe bet it’s Marathon. Of course, this particular clue just wants you to know a little bit about the origin of the race, since most people are more familiar with that than with the battle. Two clues about Marathon also mention Aeschylus, the Athenian tragic playwright best known for the Oresteia trilogy, which included Agamemnon, The Libation Bearers, and The Eumenides. These plays told the story of Agamemnon, the leader of the Greeks in the Trojan War, who returned to his palace at Mycenae only to be murdered by his treacherous queen Clytemnestra, who was in turn murdered, along with her lover, by their son Orestes with help from his sister (their daughter) Electra. That family was a tangled mess (don’t think there isn’t more to tell there, either), but Aeschylus is said to have fought for the Athenians at Marathon, so he shows up in a couple clues about it. His plays show up in many more, though, so don’t forget about him. * You are watching every episode, right? No? Well, if you’d like to start, I recommend www.ustvnow.com, which lets you store a few hours of TV online, and the free package includes two episodes of Jeopardy! a day (one new, one rerun) that you can watch at any time – but you need to be outside the States or able to trick the internet into thinking you’re outside the States to use it. If you’re not and you don’t have a TV, there are other, less scrupulous ways to watch it, which I trust you can figure out on your own.